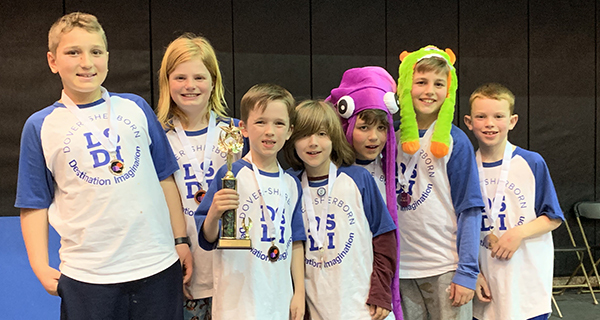 For the 9th year in a row Dover Sherborn Destination Imagination (DSDI) competed in a Regional competition against teams from Natick, Sudbury, Wayland, Newton and Shrewsbury. Nearly sixty DS students constituted ten teams from Pine Hill, Chickering, and the middle school. The competition was in Shrewsbury on Saturday, March 9, and the teams showcased their hard work, creativity, and ingenuity in categories such as Fine Arts, Structural, Technical, Improv and Engineering. 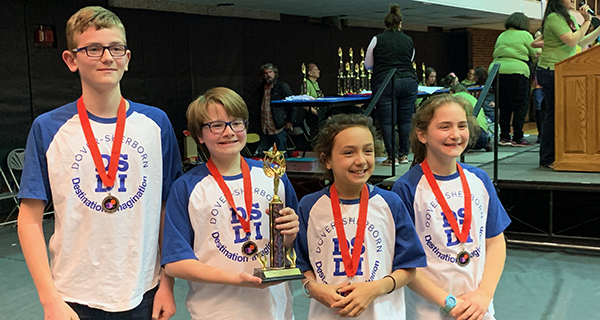 Of the ten teams competing, seven were awarded third place or higher, with three placing first in their respective categories and advancing to the Massachusetts State tournament, held at Worcester Polytechnic Institute on Saturday, March 30. The three teams competed and each placed third or higher, with two teams advancing to the Global Competition held in Kansas City, Missouri in May. The teams competed against top groups throughout Massachusetts, and those advancing to the Global Competition will face teams from around the world. All competitors have worked tirelessly since the fall at creating solutions to “Central Challenges,” which are published annually by the global Destination Imagination program. They are open-ended challenges for teams to choose from in focus areas of Technical, Scientific, Fine Arts, Improvisational, Structural, and Service Learning. Participants learn and experience the creative process from imagination to innovation, which fosters their curiosity, courage, and creativity. They complete their challenge as a team, all while also participating in tasks known as “Instant Challenges,” which are problems presented to the team to be solved on the spot. Instant Challenges involve acting, building, teamwork and creativity, with unique supplies and a limited amount of time. The Dover Sherborn DI program has grown tremendously in the last nine years. It was piloted in 2010 with just one team of five students. The program has since expanded and is stronger than ever, with teams from DS Middle School, Chickering, and Pine Hill all participating. Since 2013, at least one team from the DSDI program has participated in the Global competition held in May. The Blue Mustaches (Caroline Guillette, Kate Hammerness, Naimh Sharpe, Dylan Melenovsky, and Katie Murray); 7th grade, Improv Middle School level. The Dover Sherborn DI Dudes (Wilson Eppich, Noah Mish, Beckett Newmarker, Andrew Nostrame, Keiran Sharpe, Weston Tayebati, and Tyler Wetjen); 3rd grade, Improv Elementary level. The DIYers (Charlie Bunn, Tessa Correll, Emma Motely, and Lucas Olmstead); 5th grade, Scientific Elementary level. The Blue Mustaches and The DIYers each placed second in their respective categories and will advance to the Global competition. For more information about DI, visit www.destinationimagination.org or www.madikids.org. As the program continues to grow, DSDI is always looking for more community involvement. To become involved in DSDI as a volunteer, contact Megan Abbett at abbettkm@msn.com.